Even before Nazi Germany’s declaration of war on America on 11 December 1941, the U.S. Army was coming to terms with the need to adapt its arsenal and operational doctrines to the evolving European battlefield. Having witnessed the rapid advances of armored and mechanized forces in the German Blitzkrieg across Poland, the Low Countries, and France, War Department planners, including the future commander of Army Ground Forces (AGF), Lesley J. McNair, set out to amend a strategy based around static and localized anti-armor defense beginning in the latter stages of 1940. Within a year, the conclusion that mobile, massed anti-armor operations should be employed to counter armored attacks had been adopted after doctrinal endorsement from Army Chief of Staff General George C. Marshall. However, as German panzers tracked further into Eastern Europe, refinement of the tactics and development of the vehicles with which to blunt the new method of warfare still lagged. Despite flaws in its doctrine and weapons developed to counter the panzer threat, the Army was well on its way toward developing its Tank Destroyer Force and several tank destroyer systems, including the M18 Hellcat, by the time the United States entered World War II. 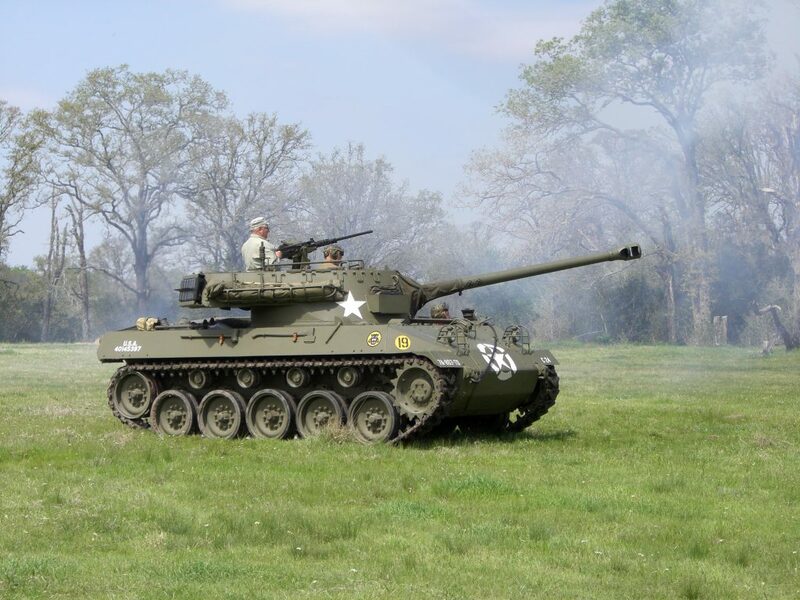 The origin of the M18 dates to these first few weeks before the United States’ entry into World War II, when, on 27 November, Lieutenant Colonel Andrew D. Bruce assumed command of the Tank Destroyer Tactical and Firing Center at Fort Meade, Maryland. Bruce, a respected planner from the War Department’s G-3 section, immediately set out to develop a vehicle fast enough to maneuver around the flanks of enemy columns to attack from the rear, and with enough killing power to distinguish it from the infantry support oriented tanks like the M4 Sherman. The solution was the Gun Motor Carriage (GMC), although the first few models developed by the Army were anything but effective. The M6 design, which featured a 37mm anti-tank gun attached to a modified light truck, was woefully ineffective during initial use in the North African campaign, as was the M3, a half-track armed with a low-velocity 75mm gun. Needing a rugged but fast moving vehicle to close with enemy armored attacks from the likes of the Panzer III and Panzer IV, the AGF Board moved to standardize the M10 Wolverine tank destroyer, armed with a 3-inch gun, by the spring of 1943. The M10, based on the M4 Sherman chassis, was a reliable fighting vehicle to match the medium German panzers in the deserts of North Africa, but it was not the long-term solution Bruce had in mind. 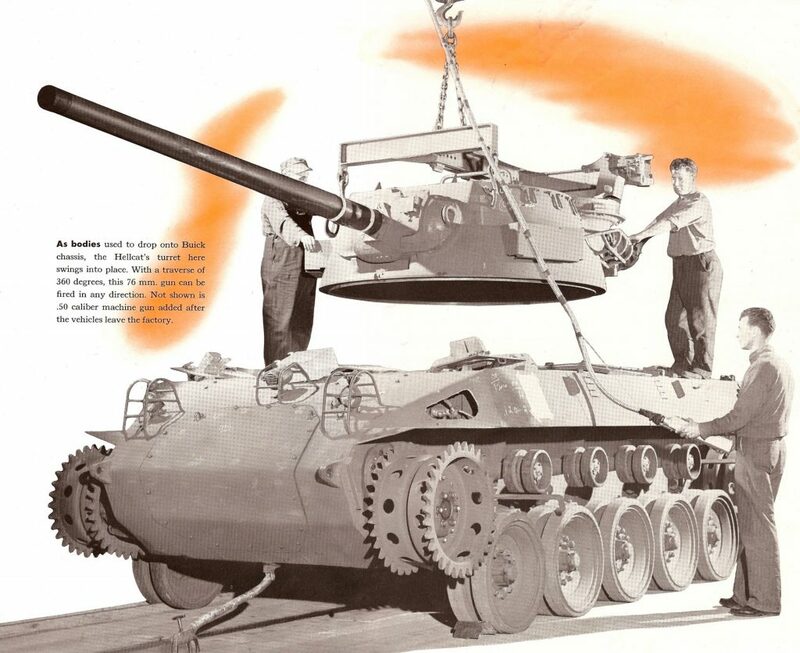 Favoring a vehicle with greater speed, cost effectiveness, and mobility, while at the same time not sacrificing firepower, Bruce secured the test models for his ideal panzer hunter with the T70 prototype. Capable of top road speeds in excess of fifty miles per hour, the twenty-ton, second generation tank destroyer packed a high-velocity 76mm main gun with the same stopping power as the M10’s 3-inch gun. By June 1943, Buick was already rushing T70 models into production, and by the time the M18 was standardized in March 1944, the nickname “Hellcat” was already being used for promotional purposes. The M18’s service in combat began as it was still being standardized, with five of the new T70 models being sent to the Italian campaign that same spring. 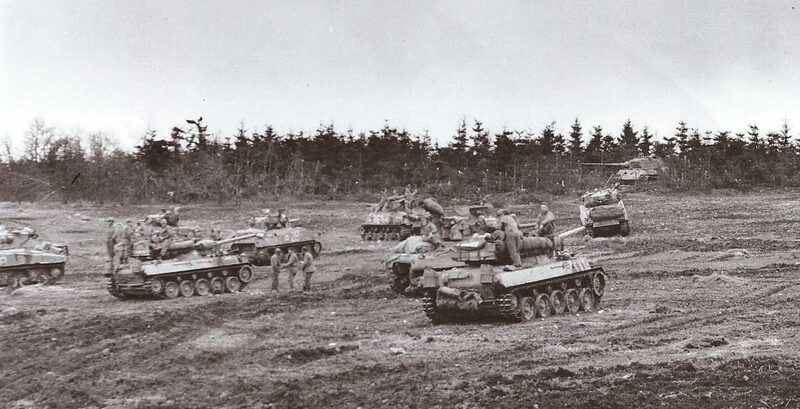 Three of these vehicles were deployed in the reconnaissance company of the 894th Tank Destroyer Battalion, participating in breakthrough operations at Anzio in late May. While deployed in Italy, initial use of the T70 revealed design flaws which would come to limit the M18’s usefulness as a tank killer later in the drive across Europe. The Hellcat’s speed and ability to get into firing position were admired by M18 crews, but the lack of killing power of the 76mm gun and minimal protection offered to the crew made commanders tread carefully in converting whole battalions over from the M10. With only thirteen millimeters on the front hull, the M18’s armor was less than that of the M8 armored car, and much less than the two inches of frontal armor on the M4A1 Sherman or 1.5-inch armor plate on the M10. Likewise, the awkward interior layout of the M18’s turret made reloading the main gun cumbersome and slow in combat situations. The introduction of heavier German tanks, such as the Mk V Panther and Mk VI Tiger, presented additional problems. France, only three would be equipped with the Hellcat prior to landing in Normandy. The 603d, 704th, and 705th of Lieutenant General George S. Patton’s Third Army all came ashore in Normandy by late July 1944. Like all self-propelled tank destroyer battalions, those fitted with the M18 were composed of a headquarters company, reconnaissance company, three gun companies, and a medical detachment. As defined by revised Field Manual (FM) 18-5 issued in July 1944, the three gun companies each contained three platoons of four guns, giving the entire battalion a total of thirty-six tank destroyers. While FM 18-5 called for an aggressive spirit of action aimed against the flanks of advancing enemy armored formations with the entire battalion force, the initial breakout from Normandy during Operation COBRA saw the M18 serving less as a tank hunter and more in convoy protection and infantry support roles. Due at least somewhat to a lack of a concerted German panzer counteroffensive immediately after D-Day, the delay in the M18’s meeting with the Panther and Tiger tanks of the Wehrmacht may have been for the best. While ordnance tests back in the States concluded the 76mm gun could pierce the frontal armor of a Tiger at ranges up to 2,000 yards, the tests were marred by flaws which underscored the overmatched firepower of the M18. In truth, M18 crews quickly learned that frontal fire at ranges beyond 300 yards would have little effect on the heavy German tanks; at the same time, the Hellcat provided no protection against the high velocity 75mm and 88mm guns of the Panther and Tiger, respectively. 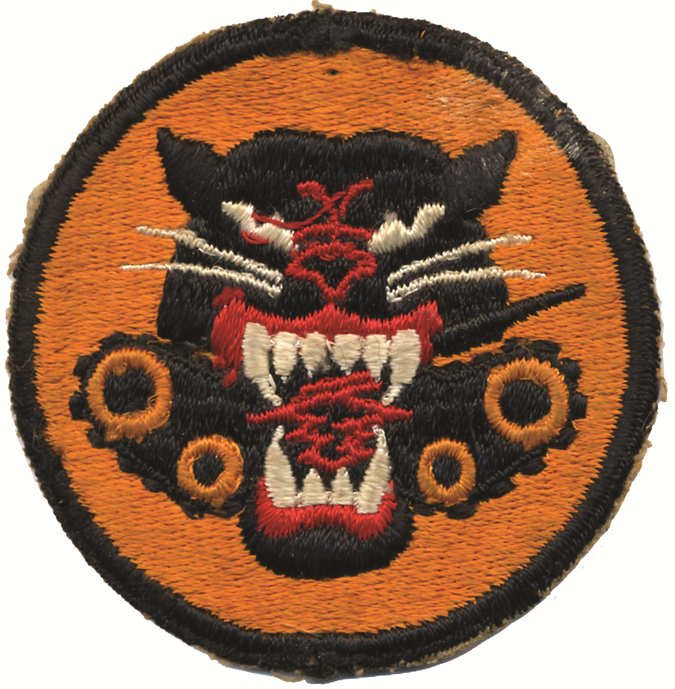 Outgunned as they were, Hellcat crews managed to destroy a significant number of enemy tanks, and were effective in blunting German panzer attacks when given the opportunity. As was the case of many U.S. armored fighting vehicles during the war in Europe, Hellcat crews proved adept at developing new tactics when taking on German tanks by learning the strengths and weaknesses of the M18 in combat situations. In addition to using the Hellcats’ speed to get into position to fire on the flanks of German tanks, Hellcat crews learned that a well placed shot between the mantlet and the glacis plate of a Panther would cause the shell to ricochet into the driving compartment, killing the crew or disabling the tank. A number of panzers were knocked out by these means when Hitler finally ordered an armored counteroffensive against Patton’s Third Army in September 1944. 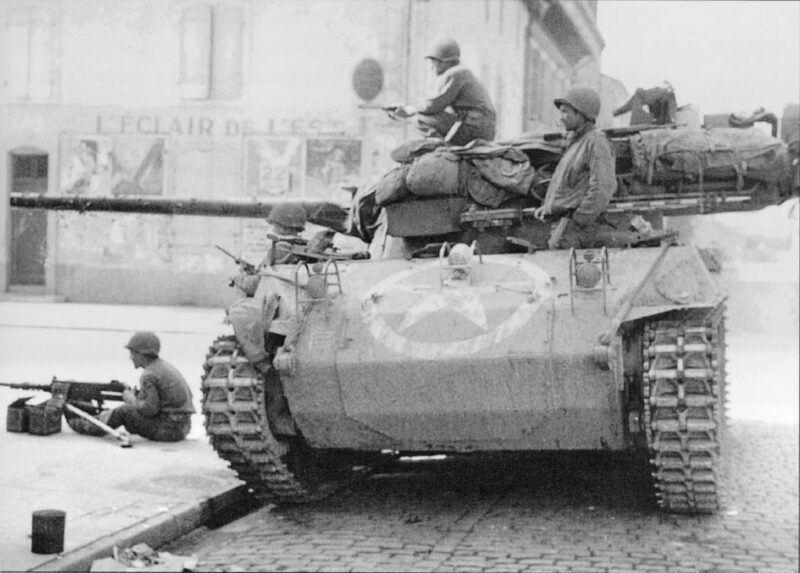 On 19 September, Company C , 704th Tank Destroyer Battalion, attached to the 4th Armored Division’s Combat Command A, helped defend the town of Arracourt when attacked by elements of the 113th Panzer Brigade. Taking advantage of the fog to sneak up on the more heavily armed and armored Panthers, four Hellcats engaged a company of tanks from the 113th around Bezange-la-Petite, firing from a slight depression and knocking out seven Panthers before dawn. Later in the day, the 113th pressed its attack in the direction of Réchicourt -la-Petite, but was met once again by Company C, which blunted an assault on 4th Armored Division’s command post. Under the fearless direction of Captain Tom Evans, the lead platoon of Company C served as an attractive target for the German tanks, which failed to notice the other two platoons of Hellcats advancing on their flanks. In the shooting that followed, the three platoons of Company C knocked out four German tanks before pulling pack, only to give chase once the German panzers and panzer grenadiers retreated. Evans himself manned the gun of a disabled M18 and was able to knock out two panzers, earning the Distinguished Service Cross in the process. By the end of the day, nineteen German tanks lay burning at the hands of the Hellcats. When the fighting ended a few days later, the victorious American Hellcats accounted for thirty-nine panzers destroyed or disabled. The fact that only seven Hellcats were destroyed or disabled speaks not only to the tactical flaws of German armor advancing without proper reconnaissance, but also to the proficiency and adaptability of the M18 crews. 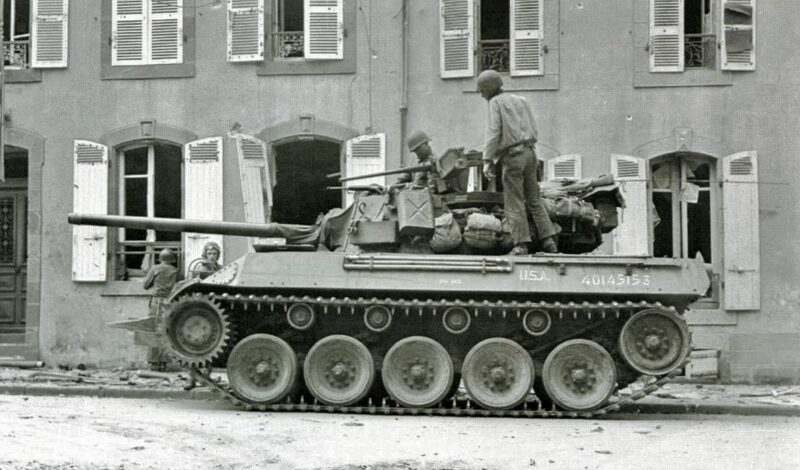 Despite the Hellcat’s success around Arracourt, units equipped with M18s continued to engage in what FM 18-5 described as “secondary missions.” As a result, the M18 was typically deployed in company size strength amidst infantry and combined combat elements. Serving as an infantry support weapon and used extensively in clearing pillboxes and fortified enemy positions within towns, the M18, like the M10 before it, was seldom ever concentrated in the massed battalion formation designed for anti-armor operations. While effective in these secondary operations, the new role of the M18 came at a cost. Complaints about the open turret configuration and exposed .50 caliber machine gun were common, while the lack of a coaxial machine gun afforded little protection to the exposed heads of the tank driver and assistant driver. Far too often, M18 crews were forced to use their 76mm cannon against enemy infantry targets, depleting crucial ammunition for use in anti-armor purposes. Along with the light armor and lack of penetration power of the main gun, these flaws remained enduring weaknesses of the M18 and underscored the contradictory nature of tank destroyer doctrine. The Hellcat would have one more opportunity to prove itself against the heavy panzers of the Wehrmacht when the Germans launched their last-ditch offensive through the Ardennes in December 1944. The M18s of the 705th were integral in the defense of Bastogne. 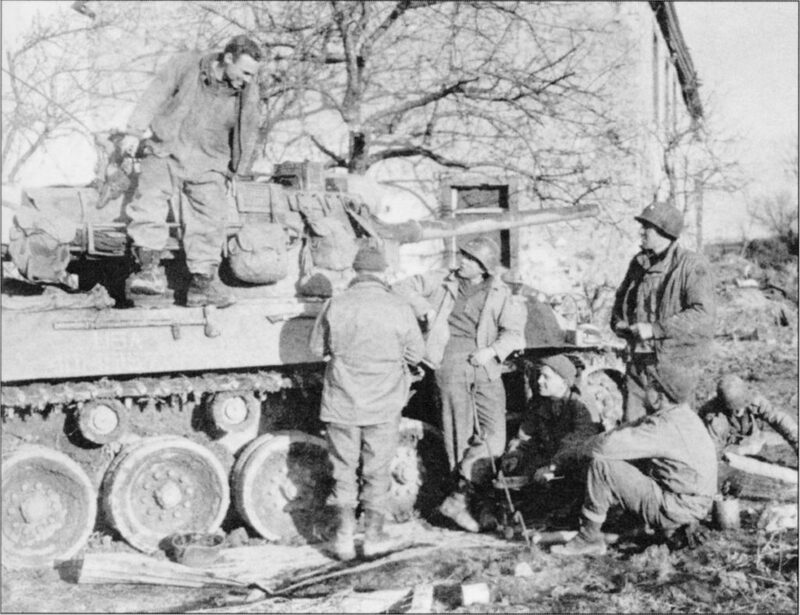 When the 15th Panzer Division attacked positions held by the 101st Airborne Division on Christmas Day, the 705th and its M18s helped hold the Germans at bay. On that day, M18s were credited with destroying twenty-seven German tanks, with only six M18s lost. Fighting in the Ardennes convinced the Army of the need to reequip its towed tank destroyer battalions in favor of self-propelled systems like the M18. Although by 1945, the preference was to reequip units with the newer M36, which packed a 90mm gun capable of destroying a Panther at longer ranges than the 76mm gun of the M18. Despite the preference for the M36, a number of units converted from the M10 to the M18. A handful of tank destroyer battalions saw action halfway around the world against the Japanese. Three tank destroyer battalions deployed to the Pacific Theater were equipped with the M18, with one, the 637th, earning the Presidential Unit Citation for its role in clearing Fort McKinley’s emplaced guns during fierce fighting for Manila at the beginning of 1945. 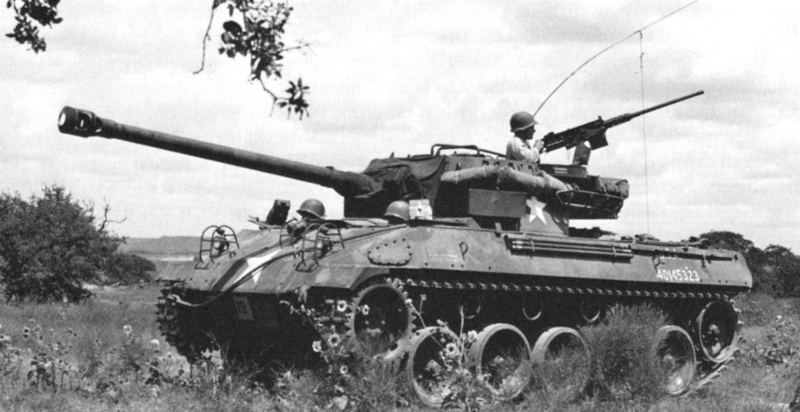 Like in Europe, however, tactical use of M18s in the Pacific deviated from the original tank destroyer concept, with the Hellcat used more in infantry support and bunker-busting operations. The majority of Hellcats may have been used like their cousin the Sherman, but unlike the venerable M4, the Hellcat did not undergo substantial changes throughout the war, although designers did experiment with variants and mission-specific designs. Even before the T70 had been standardized as the M18, the 76mm GMC was already serving as a prototype for an amphibious version that would eventually be designated the T-86. Other experiments included an attempt in the autumn of 1944 to adopt the design for use as a self-propelled howitzer, but this and other tests were abandoned with the ending of World War II. In fact, the only variant to catch on would be the M39 Armored Utility Vehicle. Utilizing the M18 chassis and doing away with the turret, the M39 was designed and built in limited quantities for use as a command and control vehicle, as well as a prime mover and armored personnel carrier. Between October 1944 and March 1945, 640 M18s earmarked for production were modified for this purpose. Very few reached the field in time for the war, but some saw action in Korea. By numbers alone, the M18 might have claimed success as a tank destroyer. Distinguished units like the 603d and 704th Tank Destroyer Battalions each reported to have destroyed upwards of ninety enemy armored fighting vehicles during the war in Europe, and lessons from the fighting around Arracourt and Bastogne point to the M18’s important role in blunting panzer attacks. Like its fellow tank destroyer the M10, the M18 suffered from flaws in a doctrine that was never fully defined. The fastest armored fighting vehicle employed by any side during the war, the M18 nevertheless suffered from a main gun that lacked the ability to consistently serve its main purpose—killing German tanks. Exposed to battlefield conditions which almost never resembled the feared blitzkrieg that spawned tank destroyer doctrine and development in the first place, the M18 was used more as a tank, and a lightly armored one at that. Nevertheless, in a war won through the training and adaptability of U.S. service members, the M18 proved it could fill a variety of tasks on the battlefield, and lives on as one of the vehicles used in the Allies’ victory in World War II.